Chiara Andolina, a malaria researcher in Thailand, feeds her mosquito colony by letting the insects bite her right arm. These mosquitoes are picky and will dine only on live human blood. Most of us do everything possible to avoid mosquitoes. 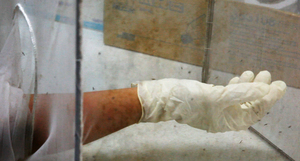 But one Italian researcher literally sacrifices her right arm to keep the lowly insects alive. Chiara Adolina is studying a new malaria drug, and she needs the little suckers for her experiments. So she feeds them each day with her own blood. Hungry mosquitoes feed on Chiara Andolina’s arm. After a few minutes, the bugs fly away and the bite marks on her skin quickly disappear. Only female mosquitoes transmit malaria, so she’s far more interested in the girls in her mosquito colony than the guys. Adolina raises the insects at the Shoklo Malaria Research Unit, a remote laboratory on the Thai-Myanmar border. A drug-resistant form of malaria is emerging in the region, and counterfeit malaria medicines are a problem. She’s working with a drug that tries to kill the parasite inside people during an early stage of the infection — at a time when the person hasn’t yet shown signs of being sick. The goal is to stop the parasite from moving back and forth between humans and mosquitoes. Here in the U.S., biologists at the Centers for Disease Control and Prevention also farm mosquitoes for their malaria research, including some nasty bugs that are resistant to insecticides. While working in Britain a few years ago, Adolina fed her mosquitoes reheated rabbit’s blood from a blood bank. Here in Thailand, though, she has a type of mosquito that will only dine on live human blood. This means Adolina has to artificially inseminate each tiny female in the colony. “It’s very difficult. It takes lots of time,” she says. A few minutes after the mosquitoes have filled themselves with Adolina’s blood, most of the bite marks on her skin have disappeared. She says her body has gotten used to the bites — they hardly itch anymore. All this, so that she can study these mosquitoes and the potentially deadly parasites inside them.